I am from the East Coast, born in New Jersey and raised as an Episcopalian, firmly grounded in the Christian faith and taken by the beauty of liturgical worship at an early age. In seeking a deeper knowledge of the Lord through Sacred Scripture wed to music, I began studies at Westminster Choir College, focusing in Music Education with a concentration in piano. In 1982, I enlisted in the U.S. Army, where I entered into full communion as a Roman Catholic. After receiving an honorable discharge from the Army in 1988, I continued my education in music, studying voice and piano performance at Southern Methodist University, Meadows School of the Arts, Dallas, where I earned a Bachelor of Music in Voice Performance. Upon graduation, I traveled to Germany as a Rotary Foundation Ambassadorial Scholar, promoting international relations. While in Germany, I received a diploma in the German Language Program from Sprachinstitut in Tübingen, going on to further studies of German at Albert-Ludwigs-Universität and musicology at Staatliche Hochschule für Musik, both in Freiburg im Breisgau. After my studies in Germany, I returned to Dallas and developed the parish liturgical music program and music education program at Prince of Peace Catholic Community, Plano. Being in that Catholic environment for seven years nurtured a calling I felt from God to enter seminary formation. I was sent by the Diocese of Dallas to Theological College, the National Seminary of The Catholic University of America. 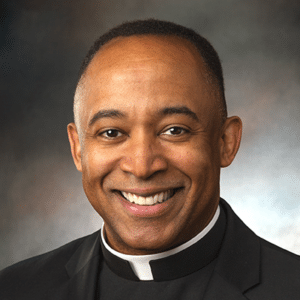 I was ordained to the Transitional Diaconate in 2005 by the Most Reverend Kevin J. Farrell, D.D., who at that time was the Auxiliary Bishop of the Archdiocese of Washington. In 2006, I earned a Master of Divinity from The Catholic University of America and was ordained a priest for the Diocese of Dallas by the Most Reverend Charles V. Grahmann, D.D. on June 3rd of that year. My prior assignments were as Parochial Vicar at St. Joseph in Richardson; Associate Director of Vocation; Chaplain and Director of the Catholic Campus Ministry at SMU (Priest in Residence at Christ the King in Dallas); and Pastor at All Saints Catholic Community in Dallas. In May of 2017, I received a phone call from Bishop Edward J. Burns asking me to take on the responsibility of assisting in the formation of the next generation of priests and was reassigned to Holy Trinity Seminary, July 1, 2017, where I now serve as Vice Rector and Director of Student Life.